Vacation rental house. Sleeps 8, 4 bedrooms, 3.5 bathrooms. No pets allowed. Aerial view of home looking east. Enjoy beautiful sunrises and sunsets from your private salt water pool with unobstructed 180 degree coastline views! View to House from Salt Water Pool. Over a half acre to spread out and enjoy! Unwind and watch whales, dolphins and turtles from the salt water pool. Every day you can wake up to gorgeous sunrises! View from back lanai. Plenty of space to relax and unwind. Vacation of a life time begins once you enter the front gate. Ocean views from the moment you step in the front door. We designed an open air "great room" and dining area where you will be hypnotized by the sound of the surf! Living Room looking west. Dining area in background. Plenty of space to sit and relax! Your gourmet fully equipped kitchen awaits the chef of your group. Need a private chef who specializes in local delights? Just let us know! Even when in the kitchen ocean views out each window! Bedroom 1. King size bed. First bedroom off the living room. Each room was designed to have ocean views! Master bedroom awaits you. King bed. This bedroom is down the hall from bedroom one and is located in the south east corner of the home. The entertainment den. Enjoy lounging and catching up on your reading or watching movies with the family. Bedroom 3. King size bed. Bedroom 3 and 4 share this third full bathroom. Bedroom 4 located on the north east corner of the home. Ocean view! Layout of the home. Designed for maximum functionality and to capture the island breeze! 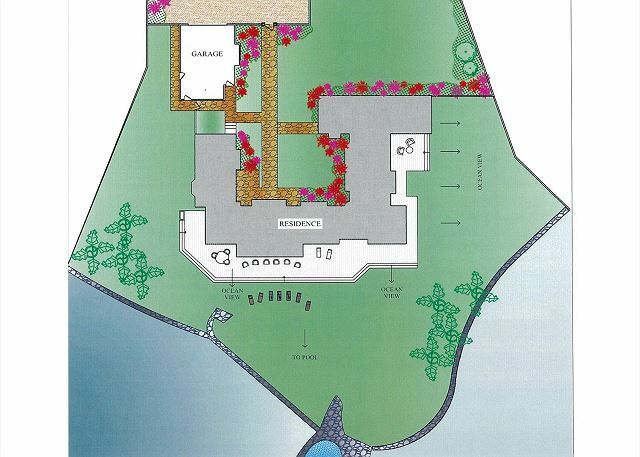 Located on an acre of oceanfront spectacular property, this 4,000 sq.ft. home sleeps eight (8) spaciously and features four tastefully decorated and comfortable bedrooms, all with glorious ocean views; a TV room/den; 3 1/2 baths; an open air “great room” and dining area where you will be hypnotized by the sound of the surf and the colors of the water; a modern fully equipped kitchen and BBQ lanai; over 1/2 acre of fragrant gardens, and manicured lawns leading to 260 yards of shoreline; one of Hawaii's only saltwater pools built into the lava rock point, 180 degree coastline views, and unobstructed sunrises and sunsets. Aloha Susan, We are are happy to hear you found Ka Lae Kiki to be paradise found! We look forward to hosting you again in the future. A hui ho! We were thrilled to be there - it is exactly as it looks online. We traveled with family over Christmas and it was a memorable trip. We have been to Kauai many times and really like Poipu which is the sunny side. We did not need to leave the property and were reluctant to do so since the setting is spectacular. We were surprised to find tidepools just beyond the pool. It was definitely a memorable time together and the home is lovely! Detailed floor plan. Designed to provide plenty of space and privacy for everyone.